Brodie Stanfield, the co-CEO of IFTech, shows off the company’s As Real As It Gets gaming suit at Durham College’s annual Research Day. Pre-orders for the Oshawa-designed suit are expected to get started next month. Gamers are one step closer to getting way into the virtual world, thanks to Oshawa start-up IFTech. 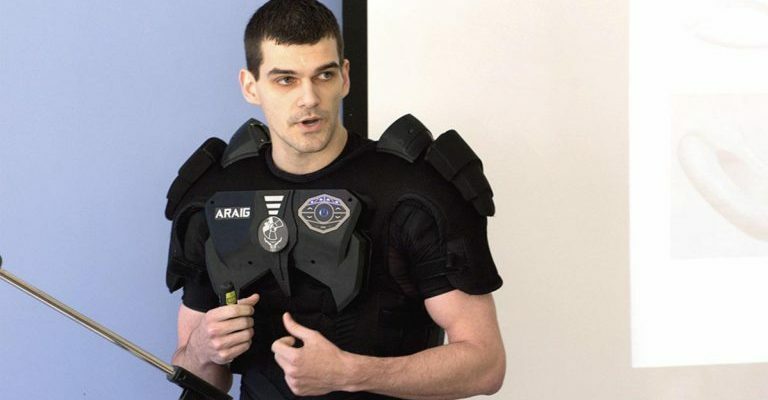 At Durham College’s annual Research Day, the armour-like ARAIG gaming suit, donned on the back of company co-CEO Brodie Stanfield, was revealed to the public for the first time. The ARAIG, or As Real As It Gets, suit is designed to completely immerse gamers in the virtual world by giving them quite a bit more than just a rumbling controller in their hands. Decked out in the ARAIG, the user will be wearing electrodes, speakers and subwoofer. The idea of the suit? You will feel what your virtual character feels. Save for the bullet, electrodes will give the wearer a small jolt to feel the shot, or have the ability to make you feel the weight of a heavy backpack, or the shock of an explosion.